Futuristic prototype for a supercar, constructed on the chassis of the Lancia Stratos and design by Marcello Gandini for Bertone. 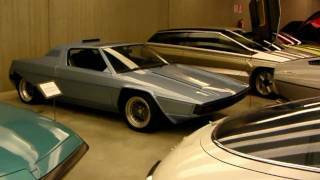 The Sibilo, built on the longer wheelbase of the Lancia Stratos and intended to give a strong message to the general public and the specialized industry, was among Bertone’s many daring designs at the end of the 1970s. It debuted at the Turin Motor Show 1978, where the extravagant bodywork proved to be a sort of monolithic sculpture with very sharp lines.